What are dental composite veneers? Finish and durability – who makes them? Are composite veneers better than porcelain veneers? Are composite veneers worth it? Are composite veneers any good? Can I get them on finance? 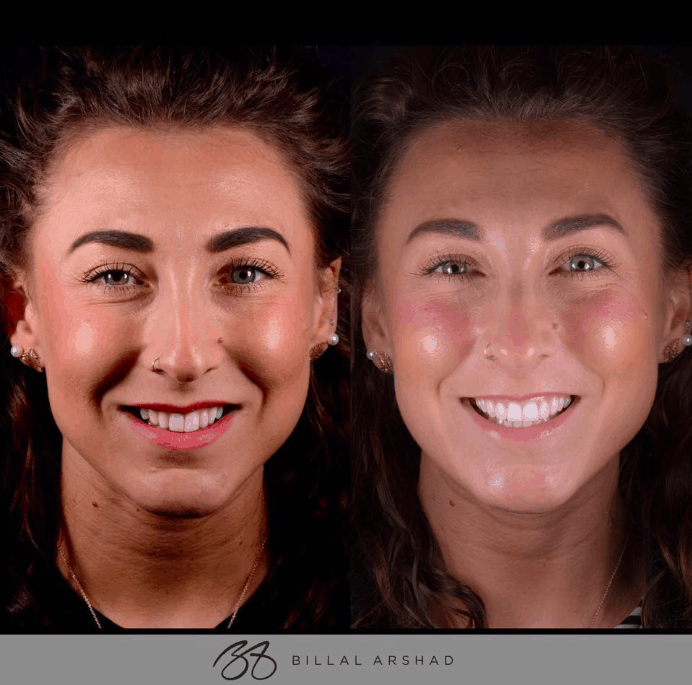 Billy has been described as 'the best dentist of the last ten years' and certainly lives up to this high praise by his meticulous attention to detail and producing some of the best veneers we've ever seen here at Smileworks. Composite veneers are also known as ‘same day veneers’, ‘componeers’, ‘resin veneers’ and sometimes ‘composite bonding‘ – although this is a different procedure – are a less invasive way to restore your smile. If you have worn chipped or damaged teeth then composite resin can be sculpted directly onto the teeth to produce beautiful, lifelike results. This is a different procedure to a dental crown, dental bridge or dental fillings which, although use the same materials, are more functional than aesthetic treatments. Composite veneers are a conservative alternative to porcelain and are made from translucent resin that is carefully sculpted and hardened by your dentist in a single appointment. Composite is more versatile than porcelain, lasts 5-7 years and is much less expensive at £200-£400/tooth compared with £500-800/tooth for porcelain or what you might traditionally think of as a full smile design procedure. This is an article about composite veneers and composite bonding. 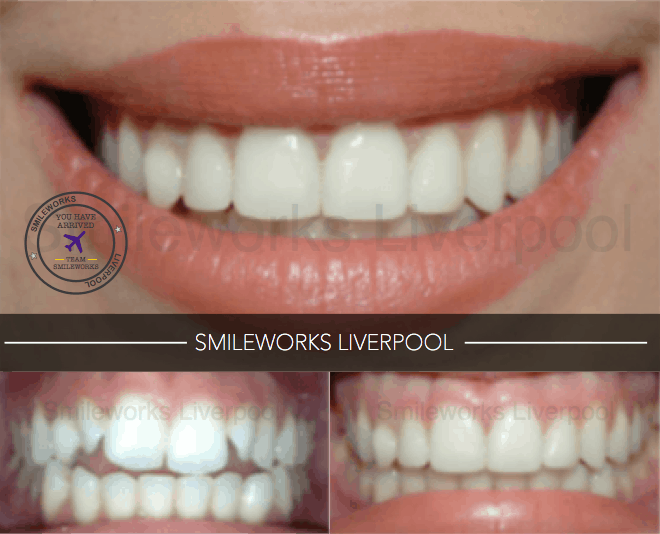 You can visit our main page veneers liverpool for more general information about all the different types of veneers. You can put composite resin on as many teeth as you choose. A full smile makeover can also be one fifth the cost of regular porcelain veneers. Composite veneers are a great cosmetic alternative to porcelain and are used all over the world by the best dentists. They can also correct a whole host of problems that are causing you to be self conscious about your smile. Dental composite resin is a special material developed for dentistry. It is a paste that is applied to the tooth and sculpted like putty. Once the desired shape has been achieved, it is hardened with a special light (light curing) and polished. 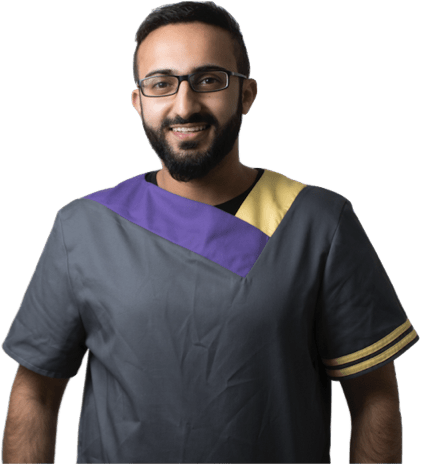 Composite materials are extremely advanced and are continually being developed to produce more lifelike, translucent and better results for patients. Some different types of composite are Renamel® by Cosmodent, and Filtek™ by 3M. Composites are safe, effective and have been used in millions of cases world wide to help patients restore their smiles. Composite bonding has not been around forever and is a relatively new dental procedure, favoured by recent generations of dentists who are interested in conserving the underlying tooth structure and keeping the patients mouth healthy. Beware dentists who specialise in Porcelain veneers only. You should always be given a choice whether to get your teeth prepared with a drill or not. Full veneers can be extremely damaging (especially for younger patients) and there is literally no turning back from veneers because your underlying teeth will look like this – forever. So when a dentist only offers these damaging and somewhat dated types of Veneers the reason is sometimes that they’ve just not updated their skills or are not comfortable with the artistic flair required to produce a lifelike restoration in resin. At Smileworks you can choose from 3 dentists for composite veneers and four in total for composite bonding. A composite veneer is the result of applying the composite resin, hardening it and polishing it to produce a new tooth surface that is perfect. This new surface hides the old one that might be worn, damaged, yellow or otherwise unaesthetic. Probably the biggest difference to you is that your composite veneers can be made and finished in one visit to the dentist. Composite veneers can take anything from under an hour to a few hours to complete and you can get beautiful results instantly. Conversely porcelain veneers involve multiple steps and a few appointments to complete. 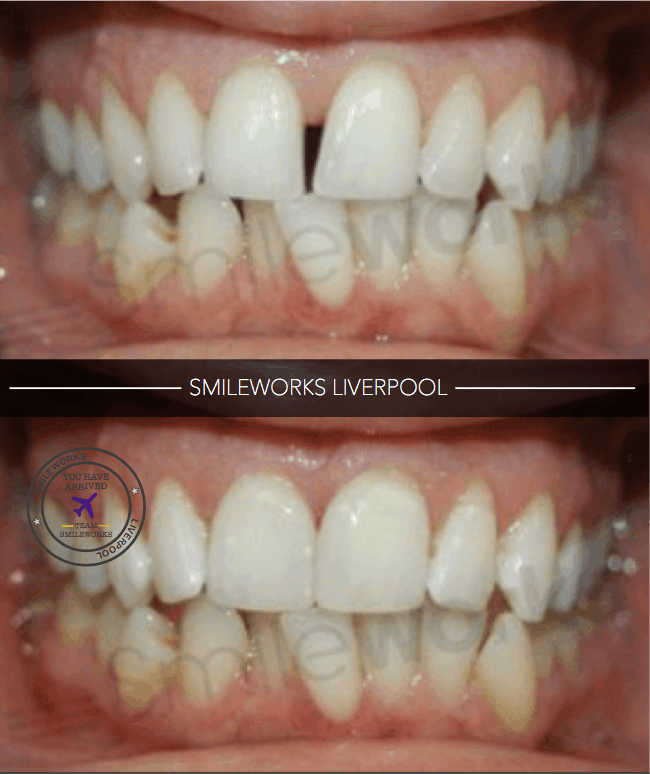 For your porcelain veneers you’ll need to return to Smileworks a few times and have your teeth prepped and have temporaries fitted before the final veneer fitting. We work with a master ceramist who will create your porcelain veneers in a lab which takes time and costs more money. The Composite veneer price is significantly less than porcelain veneers. The labwork, materials and dental work required is costly and your porcelain veneers will typically cost £400-£600 per tooth compared with £150-£200 per tooth with resin veneers. This does not mean that composite bonding is not as good as porcelain veneers. The two are just different. Many people (and even some dentists!) will not be able to tell the difference between the end results of porcelain vs resin veneers. Porcelain veneers require dental work to be carried out before they are fitted. Your original teeth need to be drilled down into a special shape to accept the final veneer. The veneer is basically glued on and fixed in place. As soon as you touch any teeth with the dentists drill, there is an increased chance that the tooth will be damaged or die. The risk that you will need a root canal skyrockets when you drill a tooth and some patients will eventually need implants as time takes its toll on a ‘prepped’ or drilled tooth. Teeth are living parts of your body and if you damage them with the dentists drill they have a higher likelihood of becoming problematic. This is one of the main risks of porcelain veneers. With composite bonding, on the other hand, there is no need to touch the teeth with the dentists drill. You won’t need any injections and the work will just involve sculpting the composite resin onto the tooth underneath. Some dentists say that porcelain veneers look better although we would disagree with this statement. The difference between composite and lab-produced veneers is simply who makes them. With porcelain veneers your dentist will speak to the lab technician or ceramist and he or she will create the veneers. They come back in a beautiful little box and everybody goes ‘wow’ and they are fitted to your teeth. Only sometimes they don’t fit right. Or other times they are slightly the wrong shade or luminosity. Things don’t always go to plan with labs and although here at Smileworks we use great labs, they still sometimes don’t look perfect so we need to send them back for refinements. We would NEVER fit work that’s not absolutely perfect so sometimes this process can be quite laborious and involve a bit of to-and-fro. Conversely composite veneers are made by your dentist. So what does this mean? Well it means that you need a dentist with real talent and skill who has worked with many composite resins and knows the process inside out. You’re dentist will also need to be artistic to create a lifelike and beautiful result. After all the composite veneer is a tiny tooth-sculpture. 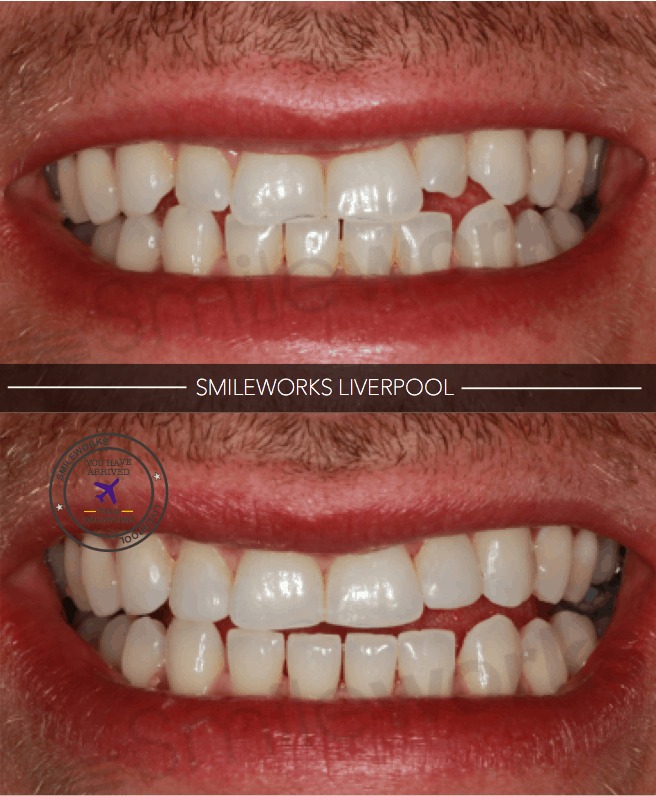 So here at Smileworks we say that the people who say composite veneers are not as good as lab veneers only have themselves to blame! It’s a bit like a carpenter saying, ‘the cabinets I make are never as good as the ones I get from Ikea’ Well get the skills to make better cabinets then! There are really two parts to this question. Patients who ask the question, “are composite veneers safe” are really asking two different things. There is firstly the question of the materials. Composite resin is extremely safe and although they contain trace amounts of all sorts of chemicals, it’s widely accepted that there’s more bad stuff in what you eat than what’s in the composite resin in your teeth. There was a bunch of people on the internet telling us that dental amalgam causes all sorts of nasty diseases but this was found to be completely false. You can read all about it here. Composite is similar. The chemicals in composite resin are rendered almost completely inert and you’re likely to get a higher dose of mercury from eating a fresh tuna steak than from your dental work. The other question is about the health and safety of your smile. You’ll read all about how porcelain veneers can ‘ruin your smile’ etc etc and this is to some extent true. Like we said, each time you touch a tooth with a drill it increases it’s risk of failing. Also veneers need to be maintained and replaced a number of times in a patient’s lifetime. Composite veneers on the other hand do not carry any of these risks. Sure they may chip off but you can get them bonded back on or remade for very little cost. 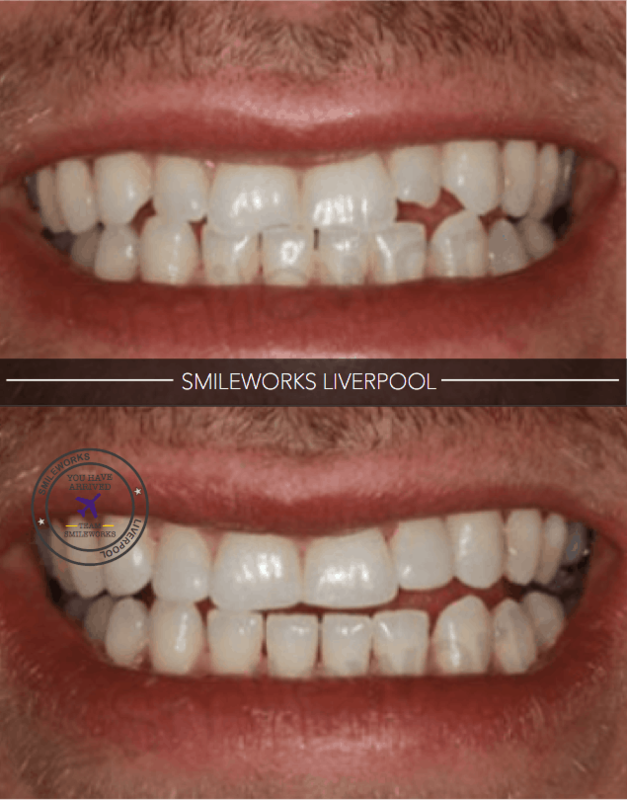 If you get composite bonding at Smileworks we guarantee our work and will fix your chips and cracks up for free if they are not caused by your own neglect. So resin bonding is arguably much safer for your smile than porcelain veneers. It’s a conservative, less invasive method that is fully reversible, unlike veneers that are a huge decision and an even bigger investment that must be considered carefully. We’ve already discussed this briefly but to learn more about the price of veneers see our main article on veneers cost here. If you’re interested in getting cheap veneers abroad then follow the link here. Composite veneers last 5-10 years and cost between £200-£400 per tooth. Porcelain lasts 10-25 years, costing between £400-£850 per tooth. Composite is minimally invasive and doesn’t damage the underlying tooth structure, making it popular with younger patients. It’s also a single appointment procedure which many find more convenient. What's the difference between veneer types? The procedure for resin bonding is very simple. First you come along for a consultation either with our treatment coordinator or a cosmetic dentist. At your consultation your dentist will do a full assessment of your mouth. Here they will make sure everything is healthy and good to go. You can choose to have your veneers made straight away. And your dentist will discuss with your dentist precisely what you would like. Then you sit back in the chair and your cosmetic dentist gets to work. There are no injections of any sort and your teeth are simply cleaned and prepared for the composite to go on. This doesn’t involve any drilling or filing and the composite is put straight on. Then the magic happens as your dentist shapes and sculpts the composite to look perfect. Then she polishes them to make them look lifelike. And that’s it. If there are any tiny irregularities or imperfections your dentist will sort them there and then and you can start smiling and feeling great immediately. The entire process never takes more than a couple of hours and patients are always absolutely delighted with their results. Take a look at some of our work in the next section. Here at Smileworks patients who have six or more composite veneers can take advantage of teeth whitening for free. You can discuss this with your dentist at your appointment. 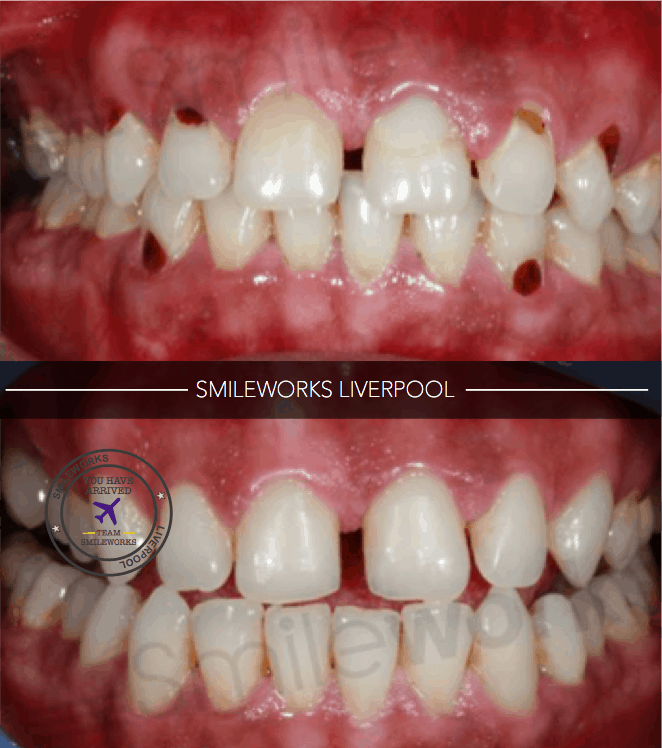 Here are some Smileworks before and after pictures of what we can do with composites. Braces and composite veneers – check out the shape of the teeth before and after. This is a difficult question and is almost largely dependent on how well you look after them. If you have bruxism (tooth grinding) then your composites will chip and crack just like your normal teeth. 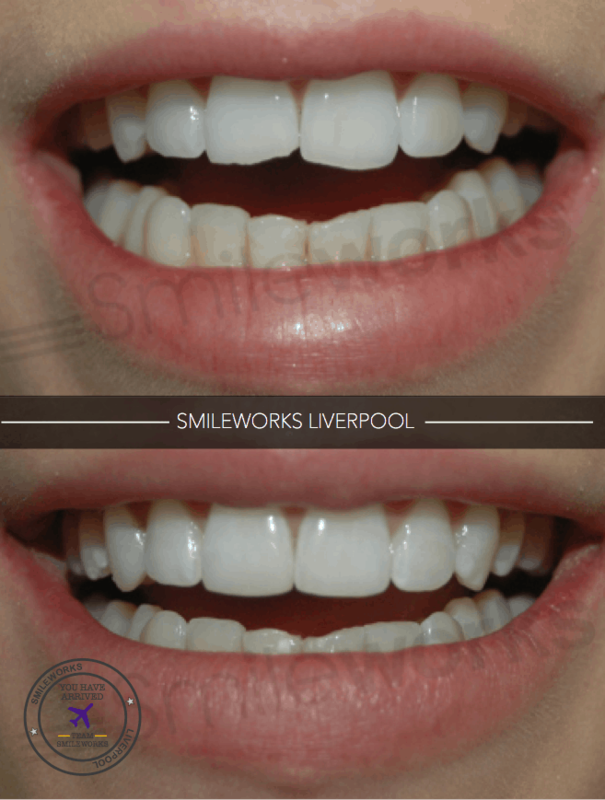 Your Smileworks dentist can make you a night guard to help keep the veneers looking in tip top condition for longer. But the way you bite your teeth together and wear and tear is unavoidable and most estimates for composite veneers are between 2-8 years. Remember that porcelain veneers last for between 10-20 years but can be five times more expensive. So the lifetime of composite veneers may be something that you worry about but is rarely a problem for patients. 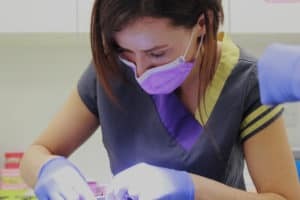 If you keep chipping your composites and there is an underlying problem then our talented cosmetic dentists will be able to help you with it. Here at Smileworks we have 100% happy patients – you can see our five star google reviews here. And we’ll do everything to not only guarantee the work but make sure that your smile is healthy and looking great with your resin veneers for a very long time. Composite veneers are safe in that the resin material they are made from is inert and will not cause you harm. They are also less invasive than porcelain because the teeth do not need to be drilled as the resin is sculpted onto the tooth surface by your dentist. less invasive, better for your oral health, look just as beautiful, are cheaper and last for a long time. But they are not better only different. If you have significant problems or badly damaged teeth then porcelain veneers may be your only option. But for two patents who could choose between the two and are both suitable, we’d go for composites every time. We’d surely say yes to this question. They are significantly better value than porcelain and some patients simply don’t have £5,000 sitting around in their bank accounts. Also if you are a younger patient and have healthy teeth, a caring dentist would be extremely reticent to start drilling them down to pegs for composite veneers. Unfortunately we see this frequently in Liverpool and are dead against it. No matter how much money you give us, we’re not going to compromise healthy teeth. We’re not going to fit your them with a bunch of giant veneers and compromise your future dental health. That’s not how we roll here at Smileworks. Sure they are. We’ve kind of gone over all the great benefits of getting composite veneers. If you’d like to get more information why not call the office and speak to someone on 0151 236 5166. Most patients are suitable for composite veneers. Like we said before, if you have badly damaged teeth then they might not be suitable for you. But many problems can be corrected that many patients have. We’d say that patients who are a bit younger with healthy natural teeth are the best candidates. Yes you can. Many patients pay for their composite smile makeovers with finance and we offer 0% 12 months. Alternatively we offer 9.9% interest bearing finance over 5 years. This makes your treatment affordable and of course the work is guaranteed. 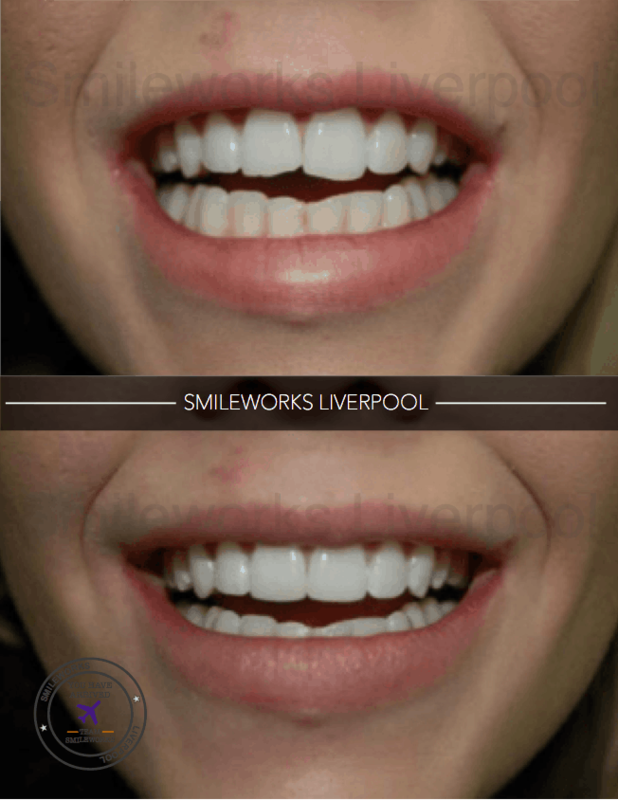 Call 0151 236 5166 for a consultation or to speak to someone in more detail about how composite veneers can help restore your smile and help you live a life of happiness, confidence and success! Our dentists will need to assess the way your teeth bite together to help you decide what type of veneers you'll need and whether you will be suitable.Please take a photo smiling while biting down on your back teeth. This can be with your camera phone. You can upload the image here. Do you want to know what it’s like at Smileworks? Take a look at our Video and 360° tour below.